ADIPEC, the Abu Dhabi International Petroleum Exhibition & Conference, was deemed the biggest and most successful in the event’s 30-year history with exhibitors from global and regional companies highlighting the latest innovations and speakers voicing opinions about the state of the oil and gas industry and its future. Leading the most packed conference line-up ever assembled for Adipec, a ministerial panel brought together international ministers and decision-makers who offered new insights on developing in-country value through the development of local talent. The four panel speakers – Suhail Al Mazrouei, the UAE Minister of Energy; Dr Ali Saleh Al Omair, Kuwait’s Minister of Oil and Minister of State for the National Assembly; Lord Howell of Guildford, former Secretary of State for Energy and former Minister of State, Foreign and Commonwealth Office, UK, and Abdalla Salem El Badri, Secretary General for the Organisation of the Petroleum Exporting Countries – discussed issues around transforming oil wealth by investing in people, particularly youth, to create employment and feed into the growth of regional economies. One of the executive plenary sessions discussed “Challenges and Opportunities for the Next 30 Years – Innovation and Leadership,” and explored the challenges of the changing landscape and need for collaboration to meet future energy needs. The Adipec 2014 conference brought together more than 600 speakers from 111 organisations, with executive panels and plenary sessions, 81 technical sessions, four academic sessions, three special IT sessions, and industry breakfasts and luncheons. A dedicated VIP programme geared towards senior industry representatives spotlighted some of the most critical issues in the industry. Executive plenary speakers included representatives from Adnoc, BP, Royal Dutch Shell, Total, GE Oil & Gas and Saudi Aramco. 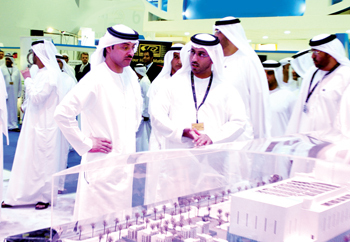 The exhibition featured over 2,000 exhibiting companies displaying thousands of oil and gas products and over 60,000 oil and gas professionals of which 53 per cent have joint or direct purchasing authority as well as key sellers and buyers from 98 countries operating in the Middle East, Africa and Asian Subcontinent. 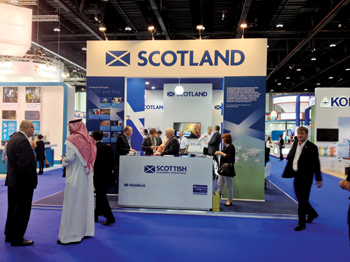 Among the exhibitors were more than 30 organisations from Scotland with Scottish Development International (SDI) announcing that in 2012 the Middle East was the sixth largest international market for Scottish oil and gas exports, representing £700 million ($1.09 billion) worth of sales. In terms of revenues by market for Scottish companies, the UAE, Egypt, Qatar and Saudi Arabia figured in the top 20 markets, said SDI, adding that 58 per cent of respondents reported the Middle East as a growth region in the immediate future, and 15 per cent saw the UAE specifically as a strong near-term growth opportunity. Several Scottish firms re-visited Abu Dhabi as part of this year’s delegation. Centrifuges Un-Limited, for example, is a specialist equipment manufacturer. It has worked with SDI in a number of markets in the Middle East and returned to the conference having joined the SDI pavilion at Adipec 2013. Its international strategy has delivered strong results for the company, which has also seen it open an office in the UAE earlier this year. Other Scottish companies that took part included Ampcontrol UK, Aubin, Coretrax Technology and Denvir. The French oil services sector, which generates more than 90 per cent of its turnover abroad, was well represented at Adipec with 30 firms displaying their wares. Among them were Atex, the supplier of electrical solutions for hazardous environments; PCM, provider of fluid pumping solutions; Saint Gobain Coating Solutions, which showcased products for thermal spraying and metal spraying, and SKM Magnetic Mechatronics, a specialist in magnetic bearings. Among the multitude of companies from across the world present at the event was China’s Jereh Group, which displayed its liquid nitrogen pumping skid, logging tools and models of simulation vessels, cementing and coiled tubing units, among other things. Schneider Electric, a global leader in energy management, presented its sustainable solutions. Its central exhibits included E-House power distribution solutions, energy management and control systems (EMCS), the Enterprise Pipeline Management Solution (ePLMS) and process control and smart oil and gas field solutions. 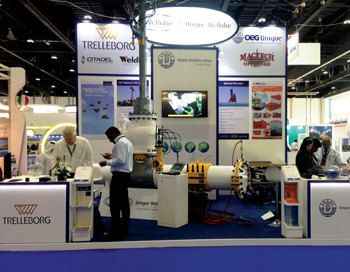 UAE company Ducab showcased its latest product line, PetroBICC. Exclusively designed for the oil, gas and petrochemical sector, the PetroBICC range offers low and medium voltage cables for power, control and instrumentation applications both onshore and offshore. Intertek, a leading quality solutions provider to industries worldwide, demonstrated its expanding oil and gas services following its investment in a new technology centre in Abu Dhabi which supports new exploration and existing operational activity.